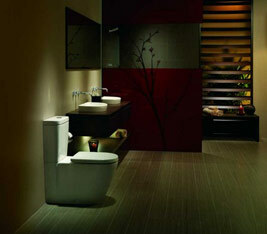 A standard toilet is fundamentally simple and without question, essential for everyday living and comfort. Unless you have attempted to repair or install a toilet, you may not have a thorough understanding of the mechanics behind this plumbing device. In general, a Frisco toilet is composed of two pieces – usually porcelain. The top piece is the tank and the bottom is the bowl – which you sit on. When you flush the toilet, it pulls the chain which is attached to the flush valve. There are two types of flush valves: rubber balls and flappers. When the flush valve is pulled up, it opens the discharge hole at the bottom of the tank and drains the tank’s water into the bowl at a very fast rate. The rushing water drives the water in the bowl and its contents down the drain. The flush valve returns to its original position over the discharge hole after the tank’s water has been emptied into the bowl. The float, which controls the fill valve drops and begins filling the tank with water. The fill valve proceeds in filling the tank while also send a smaller amount of water into the bowl via the overflow tube. Once the water has reached the appropriate level in the tank, the float rises and cuts off the water. The toilet is now ready to be used again. One common problem with toilets is that the flapper leaks water into the bowl. This causes the water level and in turn the float to drop. This triggers the fill valve to re-fill the tank. This creates the “running toilet” effect. Almost every Frisco toilet will, at some point, begin to run, leak or make odd noises. This is simply the nature of the parts inside a toilet's tank that comprise the flushing system. With a combination of brass, rubber, plastic, and other materials, there are multiple points for possible failure. Leaks from rusty tank bolts or cracked fill valve shanks are common as well. Fill valves begin to wear out and allow excess water to enter the tank, flappers become warped and allow water to run into the bowl, and even the toilet's flush handle can rust. Frisco Plumbing Pro can have each and every one of these issues fixed for you quickly and professionally, giving your toilets several more years of reliable, trouble-free usage. Frisco Plumbing Pro knows that you’re busy life may not allow for plumbing repairs. That’s why we are here. We are happy to serve you in your Frisco plumbing needs. To put your mind at ease with a professional commercial or residential plumber contact us at (972)332-3926. Q: I have water collecting around the bottom of my toilet. What is causing this? A: There may be many reasons why water would tend to collect on the floor at the base of the toilet. Does the water always seem to be there? Wipe the water up each time you see it and you will find it easier to detect the direction the water is coming from. If the water seems to come from under the toilet then it is possible that the setting seal or gasket is leaking. The toilet pan must be released from the tank and floor, and a new seal fitted. Be careful when refastening the toilet pan as too much pressure on the screws can cause the flange or pan to crack at the base. A bead of silicon under the pan will ensure good adhesion to the floor. For help with all Frisco toilet repairs call us today. We’re ready to get your toilet back in business. Q: Why does my toilet start running all by itself? A: Your toilet is in need of a repair. Water is slowly seeping past the rubber flapper in the bottom of the toilet tank. This piece is supposed to be closed except when flushing. When this happens, the water level in the tank slowly drops until it reaches the same point in the tank as when you flush it, and the water comes on and starts to refill the tank. Replacing the flapper will take care of this problem. Q: Bidets are common outside the U.S. Why aren’t they more popular here? A: That’s a good question. Studies have found the bidet to be vastly superior (hygienically speaking) to simply using a standard toilet. If you are looking for a toilet upgrade, take a look at the options. Your qualified Frisco plumber can help with the installation. Q: I have a slow flushing toilet. Is there a way to improve the flush? A: One of the most over looked problems in an older toilet is the clogged inlet holes under the rim of the toilet bowl. Over time, these angled holes (which cause the swirl action) become clogged with mineral deposits which reduce the water flow and flush action. By simply cleaning each inlet with a solid wire, you could instantly improve the flush action of your toilet. Q: Why is my toilet loose on the floor? A: In most cases a loose toilet indicates a problem with the flange. The flange is a device that both seals the toilet to the drain and attaches the bowl to the floor. Flange repair can be very complicated. We recommend you contact a plumbing professional to evaluate the situation. Q: As my toilet fills after a flush, it makes a humming noise that vibrates through the house. What could be causing this? A: This vibration is probably coming from the fill valve in the toilet tank. If you are handy, it may simply need to be cleaned by shutting off the water to the toilet and cleaning the inside of the valve for sediment buildup. If this fails, then it’s probably time to replace the valve. We recommend a full tank rebuild when work is done on any toilet components. For more information on a toilet rebuild give us a call for the expert Frisco plumber. Q: Why does my toilet start to flush but seems to stop when I let go of the flush handle? A: As with all mechanical components, things wear out or break. The problem may be with the flapper valve. Carefully remove the tank lid and flush the toilet. The flapper should open until the water completely drains from the tank. If the flapper closes too soon, you will get a partial flush. This is often caused by the chain not pulling the flapper open fully. For help with all toilet flushing problems give Frisco Plumbing Pro a call today. Q: What is a pressure-assisted toilet? A: A pressure assist toilet does not use gravity to create its flushing action. Most pressure assist toilets use compressed air within the tank to propel water into the bowl. This action will provide an excellent under most conditions. Q: Do closet augers really work to clear clogged toilets? A: They do, but they are only effective on clogs in the toilet trap behind the bowl. If the clog has passed into the drain line, other clearing remedies may be required.